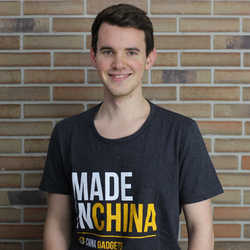 Roidmi, Dreame, Cleanfly, … The Chinese tech giant Xiaomi has a lot of subsidiaries on board, through which he has vacuum cleaners and similar products manufactured. 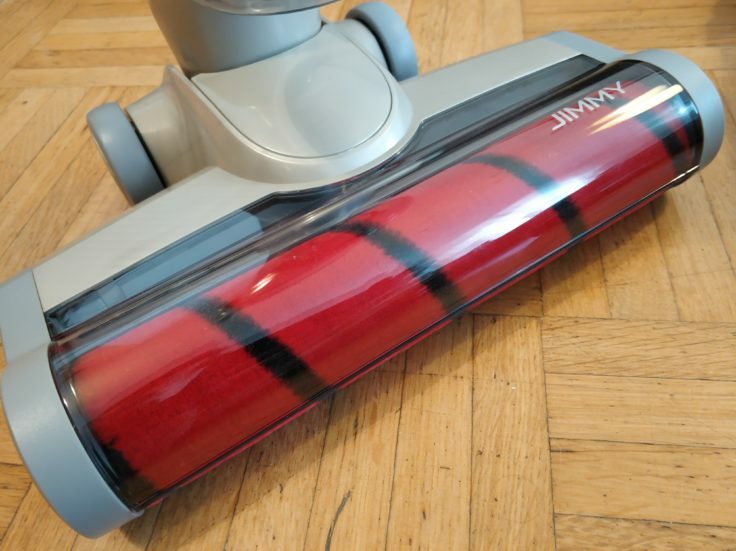 Now with the Jimmy JV71 another battery-powered vacuum cleaner with high suction power is on the market. We can’t say exactly why Xiaomi uses so many different companies, but we know how well the JV71 works. Working time 45 min., 15-20 min. on highest suction level 45 min. The scope of delivery could hardly be more sumptuous. 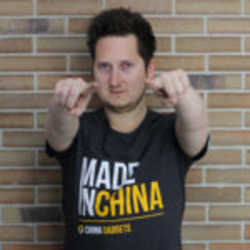 When unpacking, no plastic odour could be detected, which is not necessarily a matter of course for orders from China. In general, the first impression once again did the Chinese tech giant justice. Everything is packed finely and space-saving, unpacking is fun. Normally you don’t give away vacuum cleaners, but if you do, this would definitely be possible under these aspects. The vacuum cleaner is kept in a simple champagne tone, with occasional red accents. The design is always a matter of taste, I think this is where Lexy/Jimmy/Xiaomi really wanted to show off – which at least doesn’t work for me. I’m more in favour of darker tones and generally believe that less is more. But when it comes to workmanship, you can be absolutely satisfied – almost everything is cleanly processed and feels altogether high-quality. 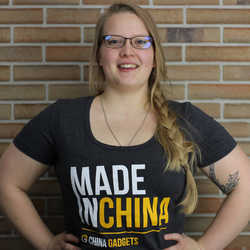 Xiaomi and the third-party suppliers of the Chinese manufacturer have been relying on this for quite some time. The design is a matter of taste, but the workmanship is predominantly good. 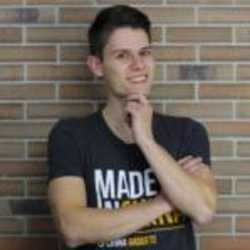 All components are made of plastic – just like vacuum cleaners. Here it concerns quite high-quality plastic. 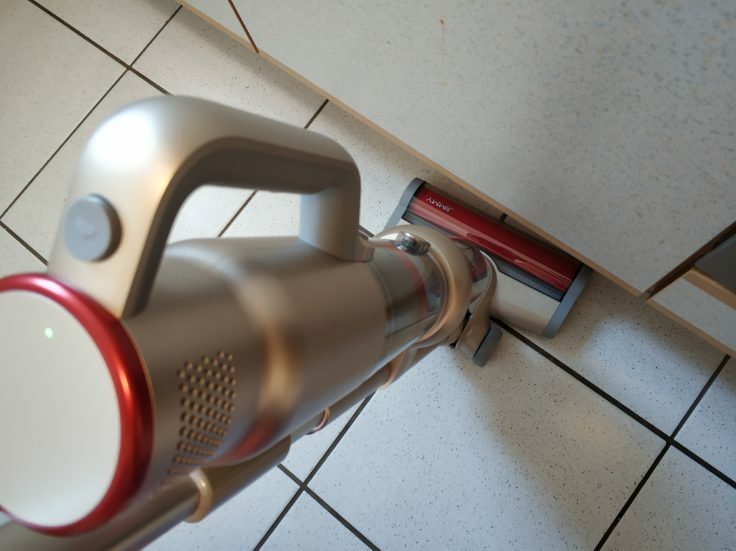 The 2.3 kg heavy vacuum cleaner (without attachements) is relatively light – in particular, because one does not have to lift the complete weight by putting the floor nozzle on the floor. Thus the “head”, in this case the handle including dust chamber, weighs only 1.1 kg, which is feasible for both sexes and each muscle strength. The height of 109 cm is relatively low and could cause back pain in people above 1.90 m during longer work. 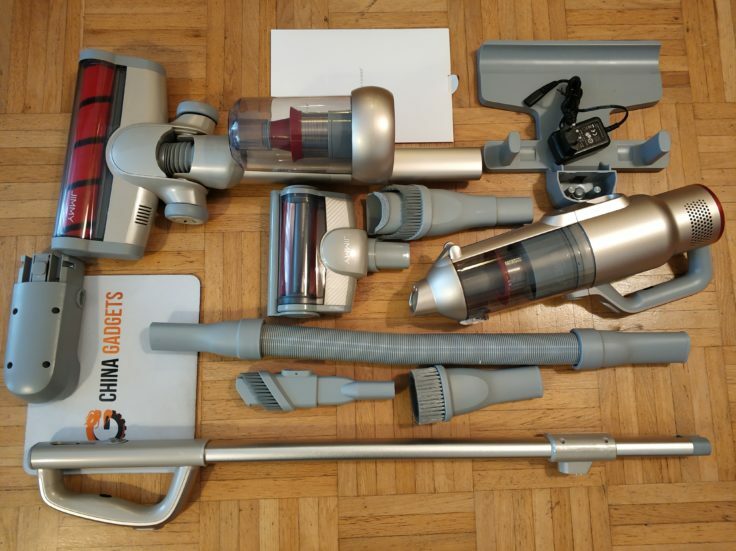 Measuring 109.0 x 24.9 x 17.0 cm, the vacuum cleaner is not necessarily suitable for tall people. 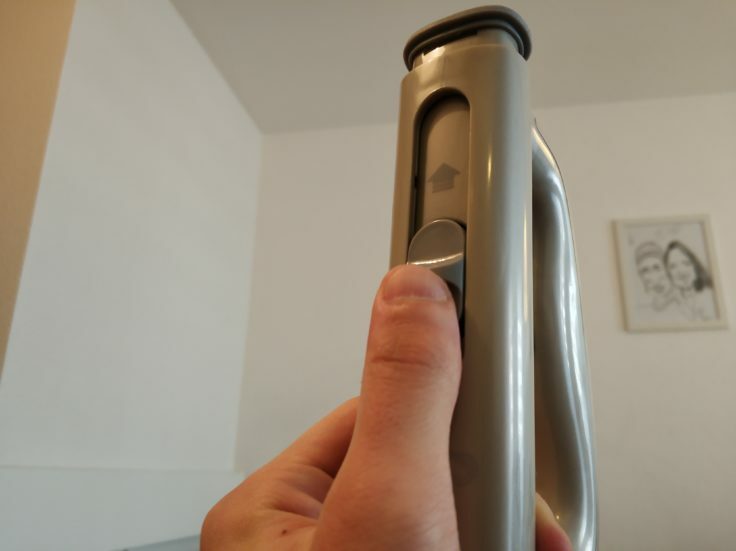 A few centimetres more height can be taken out at the top of the handle. 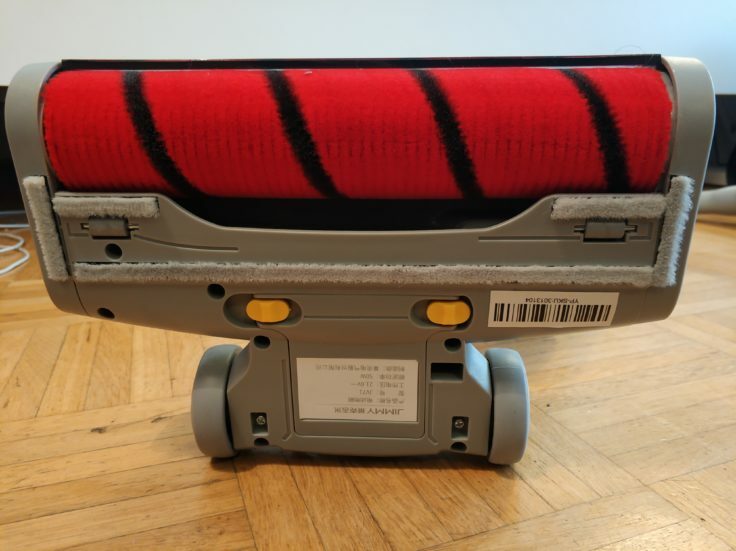 The red-black roller on the underside seems to install Xiaomi’s into every battery-powered vacuum cleaner, just like any partner company. 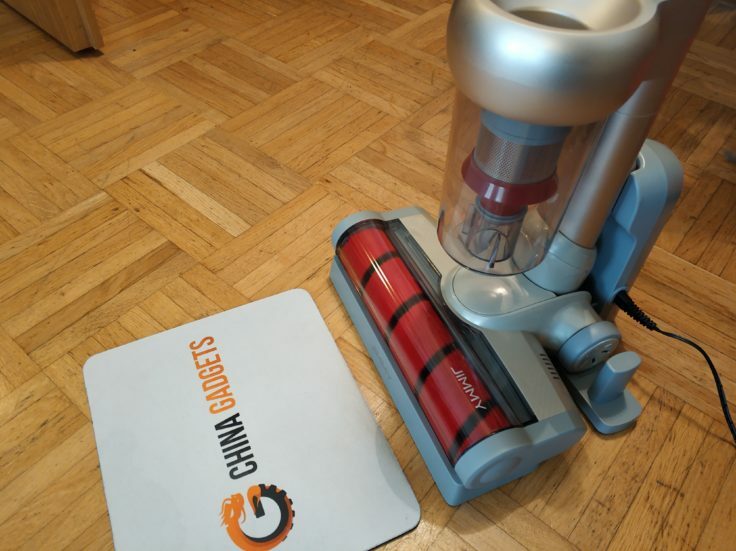 It is completely identical to all other Xiaomi vacuum cleaners. This is very practical for hard floors – and in a way also visually appealing. We already know the roller at the floor nozzle from other models. 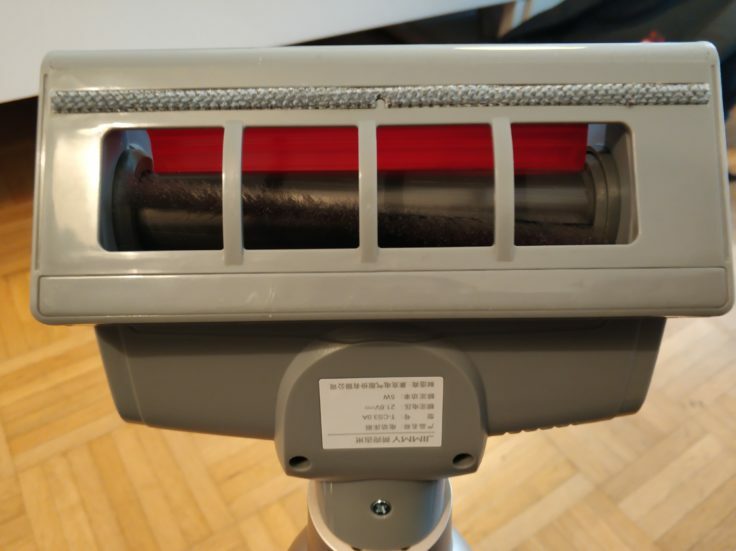 The roller can also be removed and cleaned easily. The same applies to the brush, which can be removed from the normal floor nozzle and cleaned. This is well thought out. The floor roller is very suitable for hard floors – less suitable for carpets. 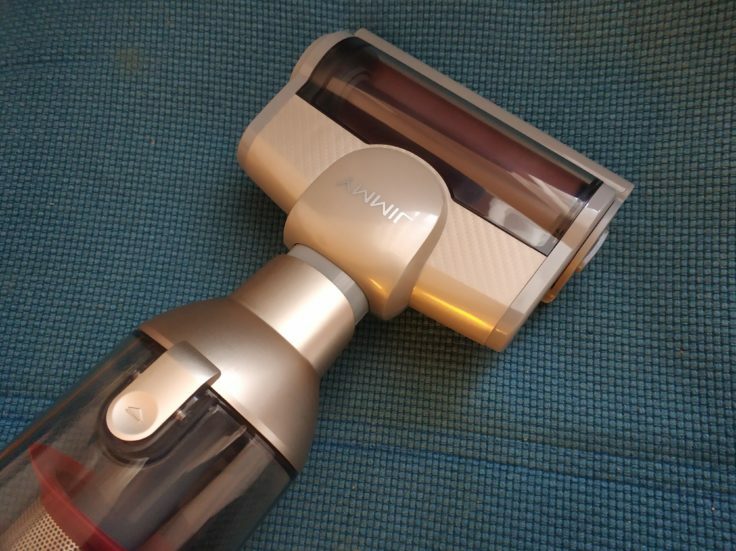 Currently, every new battery-powered vacuum cleaner comes with a multitude of essays, which makes perfect sense. Different attachments for different applications. For allergy sufferers there is the mite attachment, which kills house dust mites from textiles with 14,000 revolutions per minute. It can also be used as a hand-held vacuum cleaner. The Jimmy JV71 requires a lot of “plugging together” of the individual components. With the mite top, dust allergy sufferers can declare war on house dust mites. Mites are for house dust allergy sufferers (not the right technical term, but so understandable) like me especially in summer a torture. So that mites do not permanently keep the upper hand in bed or armchair, you can counteract with the mite attachment. If you want to know more about mites and how to combat parasites that cannot be seen with the naked eye, take a look at the JV51 test article. The underside of the mite top. The mite attachment is particularly suitable for textiles. The supplied hose increases the range for the vacuum cleaner, so you can for example vacuum well under the ceiling. However, I would have been more pleased about an alternatively usable suction pipe, the hose does not suit me optically, in the processing and in the handling at all. After all, you have to hold this plastic part in your hand and steer it while sucking on the ceiling, otherwise it will wobble in the wrong direction. The hose can only be used in combination with three attachments. The hose can be used for a little more range. Practical, but not really easy to use. The manufacturer should have put more effort into this. In general, the JV71 has a lot of possibilities, the manufacturer would like to bring the vacuum cleaner as an all-purpose weapon to the people. But if you use several attachments in practice, including hand vacuum cleaners, you also have a lot of work to do with changing everything over and over again. It’s also a pity that you don’t immediately recognize what can be plugged in where. Some essays also don’t always snap into place properly, so there are a few points to be deducted when evaluating the processing. Many attachments for many applications. Nevertheless, the JV71 is not a perfect all-purpose weapon. The handle can be removed for separate use and can also be used with all brushes and attachments. These can also be attached directly to the hand-held vacuum cleaner. So it can be said: Yes, you have many application possibilities, but it also takes a long time to see through all the individual parts. 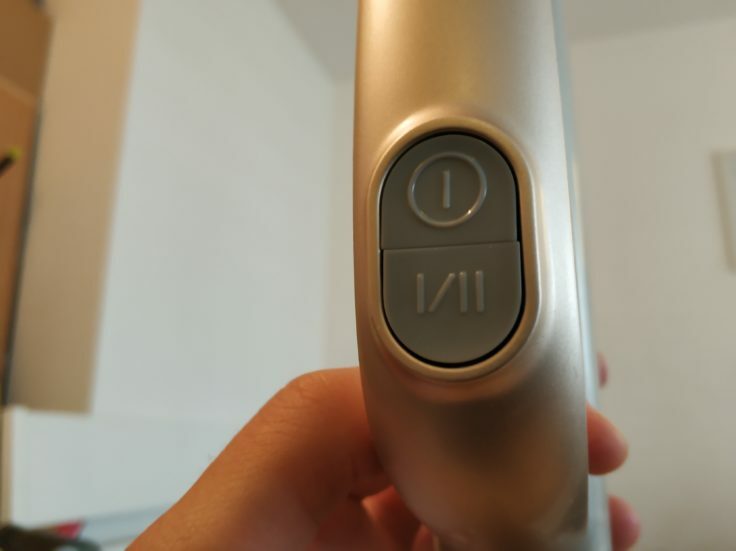 The two controls on the handle control the two suction levels. 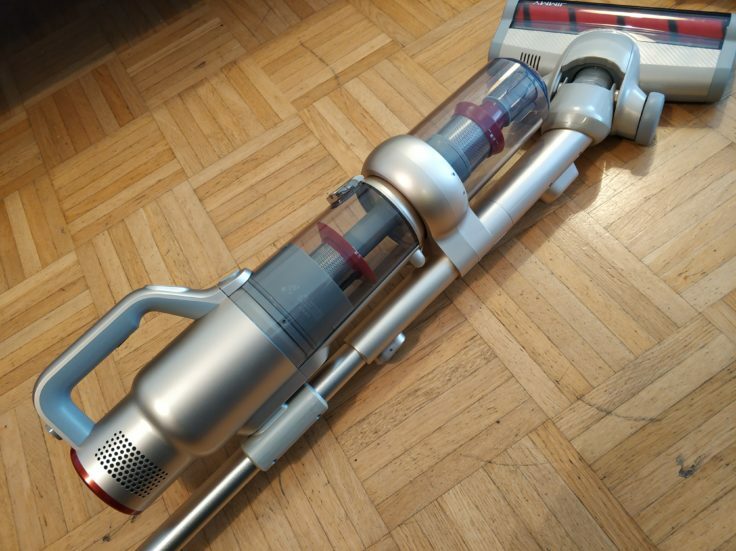 In the scope of delivery there is a holder that allows you to place the vacuum cleaner on the floor without it falling over. 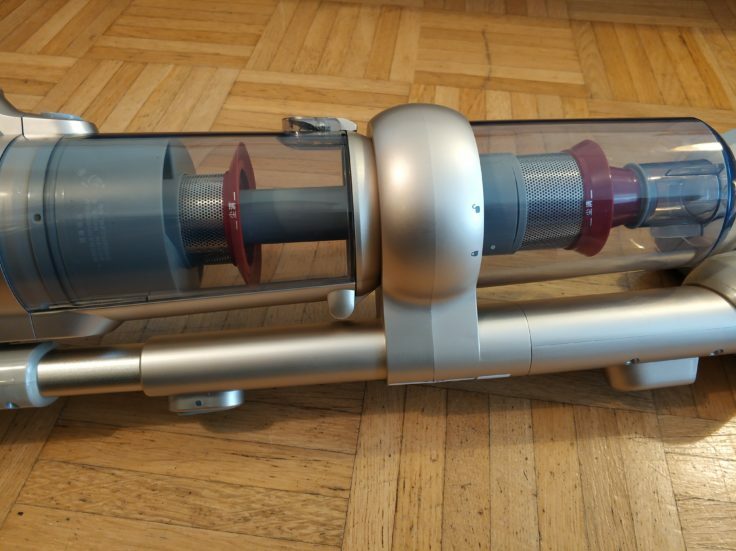 The battery-powered vacuum cleaner also stands on its own, but gives way if you knock against it. Optically, the holder is horrible, but thanks to a suction cup on the underside it fulfils the purpose of stability. Until the suction cup no longer sticks at some point. 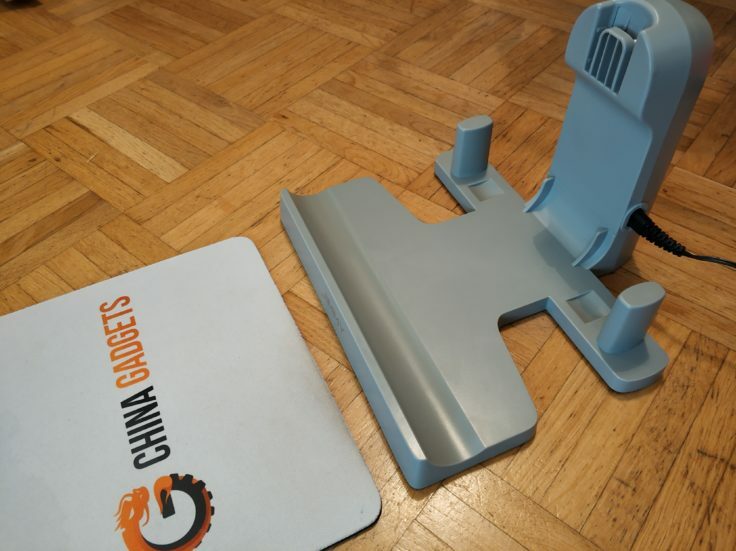 With this plastic holder you can place the vacuum cleaner on the floor and charge the battery. In fact, you have to place the vacuum cleaner against the wall, otherwise a more violent collision could mean the end of the vacuum cleaner. Charging the battery takes 5 hours, after all the International version has an EU charging cable, so you don’t need an adapter. If the battery is still on top, the vacuum cleaner will charge for 5 hours while not in use. 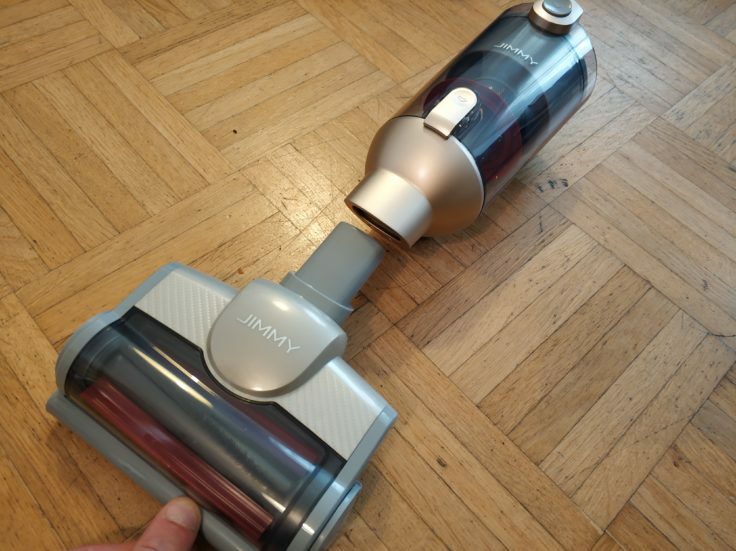 When vacuum cleaner manufacturers are stuck with new innovations, they seem to be focusing on mass instead of class – but that’s not wrong here: The Jimmy JV71 comes with two usable dust chambers packed with filters (HEPA filters are followed by a foam filter). The potential filling quantity is 0.5 l, which is absolutely sufficient. Two dust chambers in one model. The front dust chamber (in the picture above the right chamber) clicks into place by turning and can also be removed in the other direction. So you can open it on both sides and clean it well. With the metal ring in the chamber you can get even more dirt out. 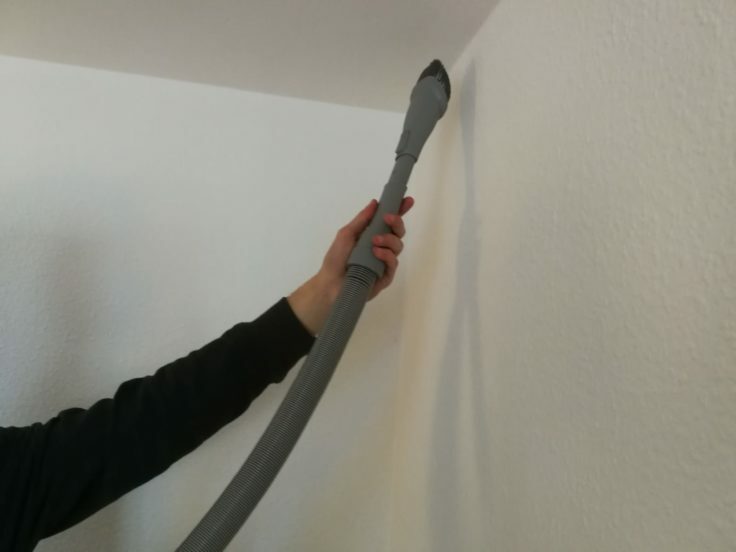 The Jimmy JV71 comes with two suction levels, allowing you to vary your work depending on the “dirt level” in your home. On the lower suction level, the vacuum cleaner has a suction power of 9000 pa, which corresponds to the suction power of the Dibea D18. 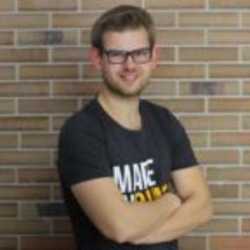 The working time on the low level is 45 minutes, which is an average value. Handling is not always easy, but the suction power is right. On the second suction stage it is already 18,000 pa, which is close to the previous China maximum value of the Dreame V9 (20,000 pa). 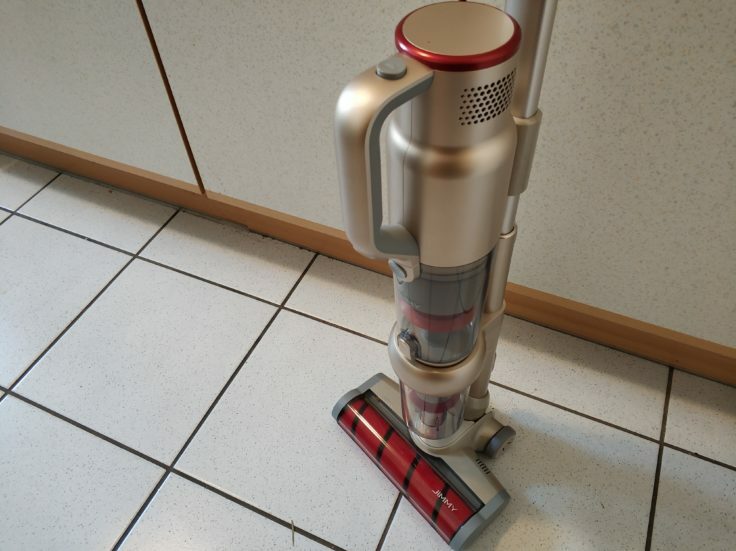 Depending on the intensity of use, the vacuum cleaner then breaks down after 15-20 minutes at the higher suction level. However, this is perfectly okay if you consider that the average value for battery-powered vacuum cleaners is less than 10 minutes. In more complicated corners, the dimensions and handling of the vacuum cleaner cause problems. Just like the Jimmy JV51, its older brother can do 100,000 revolutions per minute. For comparison: The Rodmi F8 also comes up with this value, the current best Dyson model V10 Absolute comes up with 125,000. So it can be said that the JV71 has values that definitely belong to the top class. You can also see this in use if you look at the roller on the floor nozzle during a suction process. 100,000 revolutions per minute is the minimum you would expect from a higher priced vacuum cleaner. Unfortunately, a shortcoming becomes apparent while ploughing through the household: the vacuum cleaner is only good on the surface for cleaning carpets. It does not succeed in penetrating deep into the carpet and pulling any dirt out of the fibres. Of course, hard floors work well, but they are the bread and butter business of every vacuum cleaner. 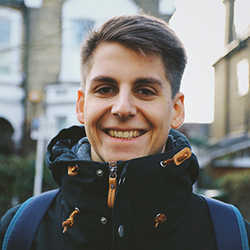 In addition, the vacuum cleaner has bigger problems with more voluminous dirt, such as nuts, coarser cat litter or biscuits. So rather to be used only for dust and dirt. This is due to the fact that the intake hood is only 7 cm wide. The intake hood under the roller is only 7 cm wide, so small parts do not fit through. The sound level measurement showed a value of 73 dB at the higher suction level and about 10 dB less at the lower. This means that the operating noise level is just within the tolerable range for humans; below 70 dB, on average, one still perceives it as halfway acceptable. Telephoning in the same room? Only when both yell. What positive things can be attributed to the Jimmy apart from a high suction power and a predominantly clean processing? Right: It is extremely flexible, a kind of adjustable all-rounder for the four walls. 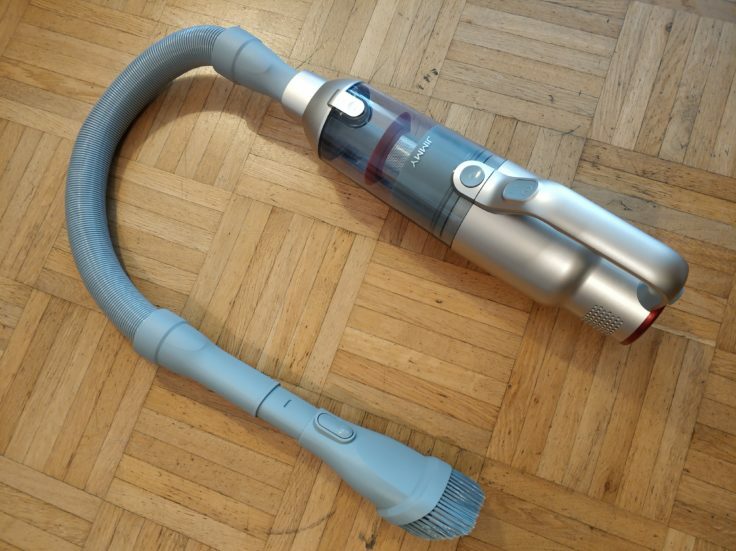 Many attachments for different applications, an extension hose, two dust chambers and several ways to disassemble the vacuum cleaner make it useful for many areas of household cleaning. 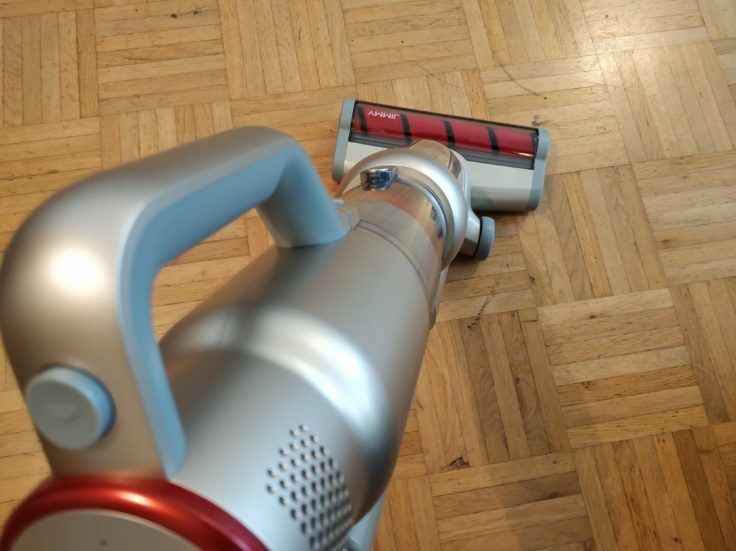 This all sounds very good at first, but the battery-powered vacuum cleaner also has a lot of weak points: It’s not really suitable for coarse dirt, but it’s absolutely fine for normal household dirt. The Jimmy JV71 is also not necessarily the perfect candidate for carpets, as it cleans the surface rather superficially and cannot pull all the dirt out of the fibres with its front roller. The handling is not always right, from time to time you lose a bit of grip with the floor nozzle. During the two-week test phase I didn’t really get that thrill with the vacuum cleaner, so I was quite enthusiastic about the Jimmy JV51. 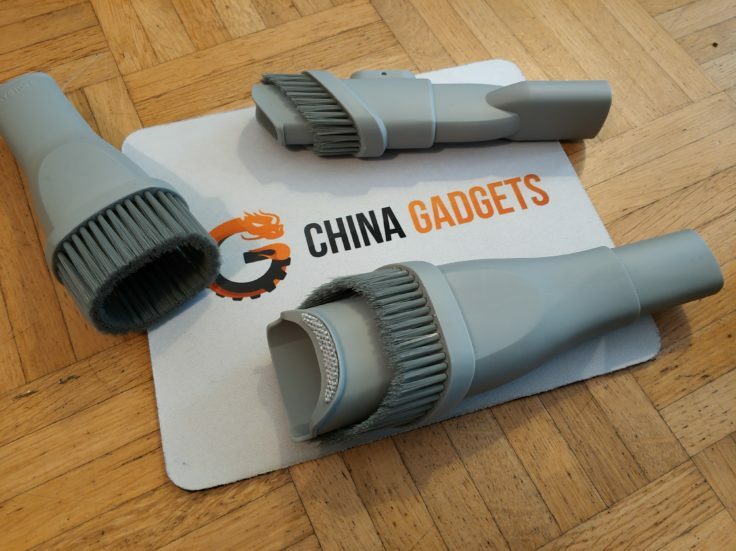 The design is not really mine (of course, it’s a matter of opinion), the suction power is also available in other models and the price is set too high in my eyes (may still change). 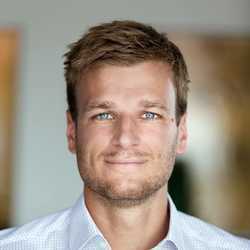 Maybe it’s due to the high expectations of (Xiaomi?) 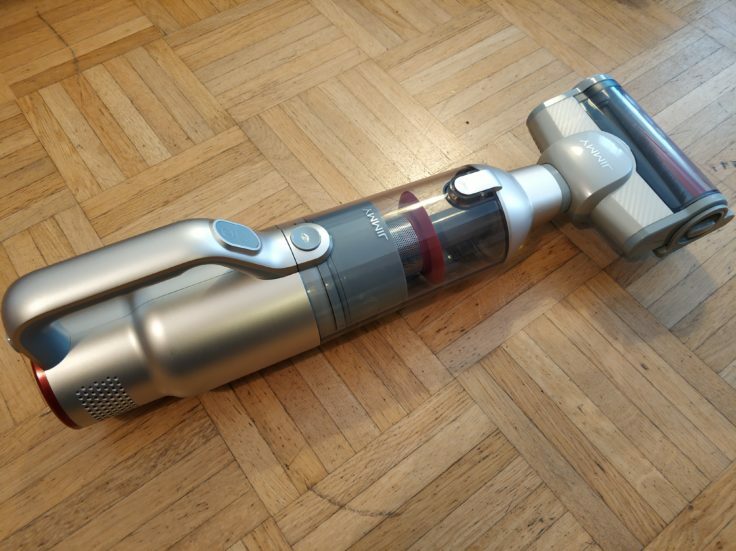 vacuum cleaners, but the vacuum looks like more than it contains. 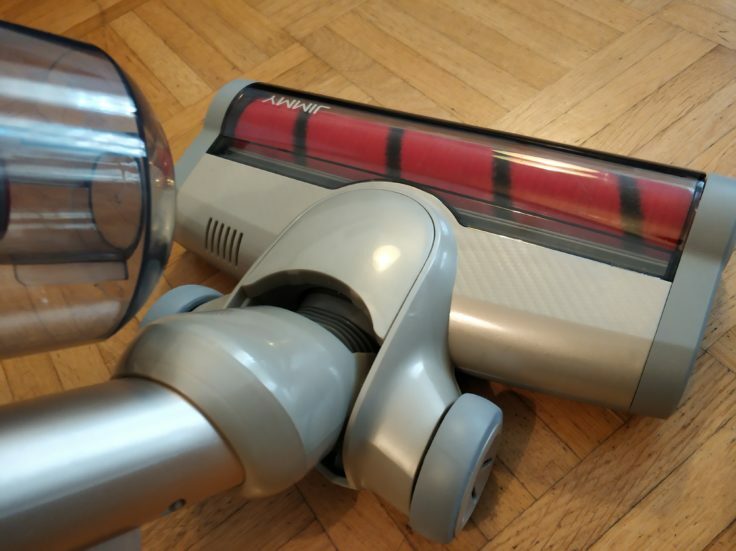 Since both vacuum cleaners are currently at the same price level, I can only advise you to buy the Roidmi F8 instead if you are looking for a powerful battery-powered vacuum cleaner. I also see the new Dibea D008 Pro a bit ahead in terms of price-performance, although the workmanship isn’t as good as here. And what about the “Lexy” in the name? We also don’t know, maybe to confuse people (#XiaomiProductChaos).